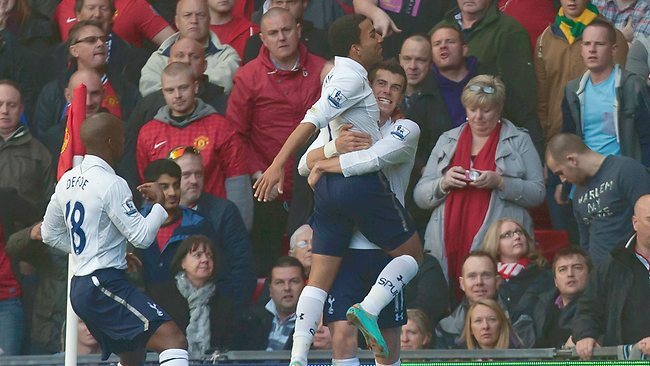 Tottenham have had a very up-and-down year, but this 3-2 win at Old Trafford was a huge deal. Just look at the disgruntled United fans in that photograph! Any time Spurs can defeat one of the biggest clubs in the world in an away match is fun times. What may have been even more significant was that the three Tottenham goalscorers--Belgian defender Jan Vertonghen, Welsh wunderkind Gareth Bale, and American Hero Clint Dempsey--are the stepping stones for the club moving forward. Unfortunately, with European soccer how it is, there are no video highlights of the match online other than guys recording shaky video straight off their televisions using their camera phones. Which decade are we in? Since their move from Montréal to D.C. in 2005, the Washington Nationals have been a pretty terrible team. But of course as soon as I move from D.C. to Kansas City, they not only qualify for the postseason for the first time in their existence, but they end 2012 with the best record in all of Major League Baseball. For the first time, Nats fans can go to games at Nationals Park without fear of being outnumbered by Philadelphia Phillies fans. In a city full of people from other cities, everyone in Washington has finally jumped on the Nationals bandwagon. And Phillies fans can finally stop being so snarky about Jayson Werth jumping ship. I know, I know. Plenty of people write off women's sports altogether. But this back-and-forth Olympic match may have been the most riveting sporting event of anything on my list. 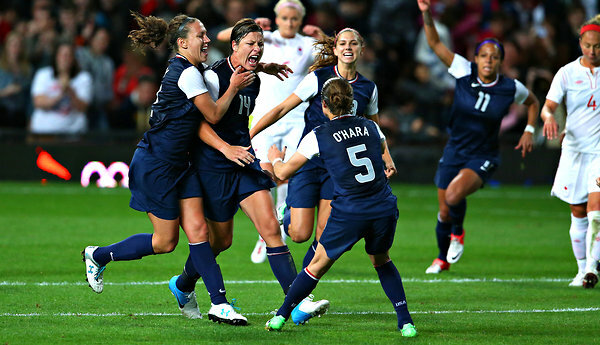 The U.S. team overcame three different deficits, and with the game in the 123rd minute of added extra time, star forward Alex Morgan claimed victory for the Americans. It was the defining moment of the 2012 London Olympics for me. Much like European soccer, the Olympics are a convoluted affair when it comes to legal online videos, so as a result I don't have any video to show you for this one either. Honorable mention: I wanted to include the U.S. men's team's first-ever win in Mexico on this list, but since the game was only a friendly, I couldn't justify it. Still, it represents a shift in demographics in America, with the game-winning goal against our biggest rival coming from Mexican-American Michael Orozco Fiscal. Although Orozco plays his club soccer in the Mexican league, he chose to play internationally for his native country rather than his parents' homeland. Finally, something with video! The vast majority of this game wasn't very exciting, but the ending sure was. Only three minutes into overtime, Joel Ward capitalized on a Mike Knuble rebound to put the puck past Boston goaltender Tim Thomas. What makes this Game 7 OT goal even more interesting is its sociopolitical context. Tim Thomas had been an inspirational underdog story of an older American goalie who plied his trade in small European leagues before finally getting a chance in the NHL and singlehandedly winning the Stanley Cup for the Bruins in 2011 at the age of 37. When the Bruins were granted a trip to the White House to meet President Obama, Thomas refused to attend, stating his strong Tea Party political beliefs. So the next year, of course Thomas is beaten in Boston (ironically the home of the real "tea party") by a player from Washington, home of his despised federal government. And now, Thomas says he's taking a break from hockey to reconnect with his faith. There's also the added layer of Joel Ward being one of only a handful of black professional hockey players, who was bombarded by hundreds of racist responses from angry Bruins fans after he scored the series-winning goal. The magic of the internet! Normally I'm not a fan of two-legged matches in soccer. Although it gives each team a chance to play at home, I think it takes some of the excitement out of the game. I was wrong with this one, though. You couldn't write a better storyline for this playoff matchup between arch-nemises. Major League Soccer commissioner Don Garber has always been adamant that for MLS to succeed as a global soccer league, it needs a powerhouse club in North America's biggest city. Red Bull New York... hasn't won anything, despite signing numerous big-name European players. D.C. United, on the other hand, is the "old guard" of MLS, having dominated the league in its early years but falling short recently. Since D.C. finished ahead of New York in the standings, they earned home field advantage in the second leg of the playoff matchup. But then Hurricane Sandy came along and knocked the power out in New York. MLS, in its desire for the Red Bulls to succeed, decided to flip the home and away legs so New York would host the second leg, giving them more time to recover from Sandy. D.C. fans felt screwed over by this decision, but the Red Bulls promised extra seats and a free bus ride for traveling D.C. supporters to the New York leg. Whatever. The first leg in the nation's capital featured an own-goal for each team, a saved penalty kick, and a player thrown out for throwing the ball at the referee. It ended 1-1. You can start watching this video at around the 5:45 mark. For the second leg in New York City, hundreds of DCU supporters took the bus up I-95 to cheer their club to victory. But of course, it snowed a ton that day. It would've made for a sweet playoff match. D.C. manager Ben Olsen wanted to go on with the match, but New York's Hans Backe decided he didn't want to risk his players in such inclement weather. The match was postponed until the next day, and hundreds of D.C. fans had to take the five-hour bus ride back home for nothing. The next day, the match featured two red cards, a retaken penalty kick which was subsequently saved, and a Nick DeLeon game-winning goal in the 88th minute. D.C. United won the match 1-0, and the aggregate playoff matchup 2-1. DCU won in classic DC fashion, and Red Bull New York continued to win nothing in classic RBNY fashion. This was a dirty, dirty game. In a good way. You didn't included your brother's ascendance to presidency of the VCU Quidditch establishment?? ?